Right to Privacy is Fundamental Right as per Supreme Court in a landmark verdict on 24th August 2017. 9 judges were unanimous in their finding, though they cited different reasons for their conclusion. A nine-judge bench of the Supreme Court has ruled that Indians enjoy a fundamental right to privacy, that it is intrinsic to life and liberty and thus comes under Article 21 of the Indian constitution it will also overrules the 1961 Kharak Singh verdict now. 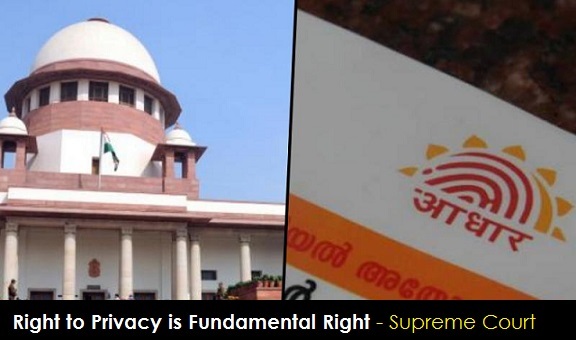 The right to privacy verdict is a major setback for the government, which had argued that the constitution does not guarantee individual privacy as an inalienable fundamental right. The bench comprised Khehar and Justices J. Chelameswar, S.A. Bobde, R.K. Agrawal, Rohinton Nariman, A.M. Sapre, D.Y. Chandrachud, Sanjay Kishan Kaul and S. Abdul Nazeer. In declaring privacy to be a fundamental right, the Supreme Court has overruled verdicts given in the M.P. Sharma case in 1958 and the Kharak Singh case in 1961, both of which said that the right to privacy is not protected under the Indian constitution. The court’s written judgement will be made available later in the afternoon and this story will be updated with details on whether it chose to sketch the contours of a right to privacy or detail how it may or may not be restricted in various applications. The petitioners, former Karnataka high court judge Justice K.S. Puttaswamy and others, had contended that the biometric data and iris scan that was being collected for issuing Aadhaar cards violated the citizen’s fundamental right to privacy as their personal data was not being protected and was vulnerable to exposure and misuse. Arguments on behalf of the petitioners were made by senior advocates Gopal Subramanium, Shaym Divan, Sajan Poovaya, Arvind Grover and Indira Jaising, and former attorney general Soli Sorabjee.